Balthasar Neumann falls out of favour. Building work on the Residence ceases until the death of Anselm Franz von Ingelheim in 1749. The episcopal principality of Würzburg was abolished with secularization. After an eight-year interregnum by Grand Duke Ferdinand of Tuscany (reigned 1806-1814) in 1814 Würzburg became part of the kingdom of Bavaria. The wrought-iron gates across the cour d'honneur, which had effectively separated this inner area from the large Residence Square, were demolished in 1821. In their place today is the Franconia Fountain created by Ferdinand von Miller the Younger. 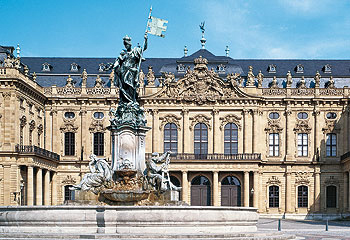 This was unveiled in 1894 as a tribute by the city of Würzburg and the whole of Franconia to Prince Regent Luitpold, who was born in 1821 in the Würzburg Residence. 16 March 1945: As a result of a devastating air raid, the Residence burnt out almost completely and only the central building with the vestibule, Garden Hall, staircase, White Hall and Imperial Hall survived the inferno, apart from the roofs. Much of the furnishing and large sections of the wall panelling of the period rooms had been removed in time and thus escaped destruction. 1950: Most of the roofs on the central building have been rebuilt. 1963: The restored court church is reopened to the public. 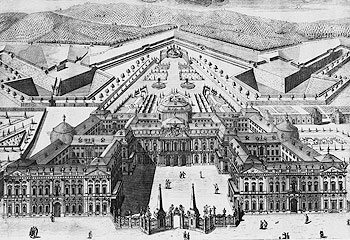 1981: The Würzburg Residence, together with the Residence Square and Court Garden, is included on the UNESCO's World Cultural Heritage List and thus placed under special protection. 1987: The rebuilding process concludes with the reopening of the Mirror Cabinet in the Southern Imperial Apartments, reconstructed in all its detail.